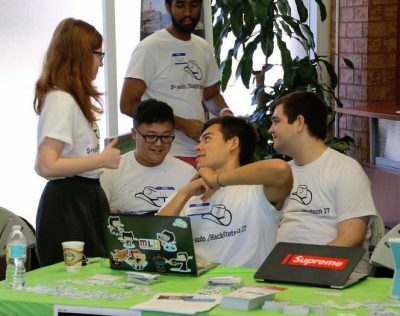 Students enjoy the second annual sudo HackStetson hackathon in Spring 2018. Stetson University’s Greater Central Florida Tech Faire + Hackathon has been awarded a $2,000 grant from the Orlando Technology Community Support Pilot Program, an initiative by the City of Orlando to give a jumpstart to efforts that boost entrepreneurs. The city awarded a total of $65,000 to 16 projects that support its tech entrepreneurial community. Eckroth and Dan Plante, Ph.D., professor of computer science at Stetson, and a team of students host the Stetson University Greater Central Florida Tech Faire + Hackathon each year, which draws interest from hundreds of college and high school students. Earlier this year, the two winners of the Apple-created “Capture the Flag” security challenge at the event won interviews with Apple, among other prizes. 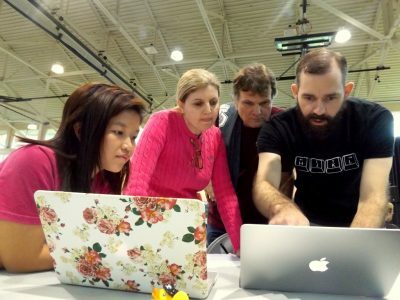 From left, Stetson computer science major Erica Kok looks on as Stetson computer science professors Hala El Aarag, Daniel Plante and Joshua Eckroth judge the app-creating competition at the Greater Central Florida Tech Faire + Hackathon. Other activities at the hackathon include a first-time hackers category, coding challenges, code golf (solving coding challenges with the fewest lines of code) and a data science jamboree (big data analysis challenges). The next Stetson University Greater Central Florida Tech Faire + Hackathon will be in the Spring 2019 semester. Anyone interested in competing should write to hack@stetson.edu.